Read J.G. Davies's Daily Life in the Early Church: Studies in the Church Social History of the First Five Centuries. 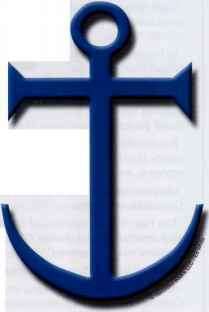 The anchor cross was used by the early Christians in the catacombs. It has its origins in ancient Egypt. St. Paul and his associates had spread Christianity as far west as Rome and perhaps even Spain. Christians could be found in all social groups, but the religion had a particular attraction for those among the lowest classes. Unlike other religions, Christianity held that all people, men or women, free or slave, were the same in God's eyes. All were worthy of respect, love, and charity. Unlike any other ideologies, Christianity considered slavery to be inherently wrong. Christians were enjoined to free their slaves, although they did not work to end the institution because it was legal and ordained by the state. Free or not, a slave who was Christian was the brother of any other Christian, no matter his or her station. What were these early congregations like? They were tightly knit communities, bound together in love. They referred to themselves as brother and sister. Their focus was on Christ, who had taken on their sins and by his death and resurrection had won for them eternal life. Two rituals or sacraments were at the center of the religion: Baptism was the rite of initiation in which the convert not only imitated Christ at the Jordan, but also shared in the death and resurrection of Christ. The convert "died to sin" so as to "rise with Christ." A Eucharistic celebration (or what would later be called a Mass) was usually offered once a week. This began with readings from psalms or other sacred texts and prayers. The presider, a bishop or presbyter (priest), in the person of Christ, would then change the bread and wine to the body and blood of Christ, which the faithful would consume (1 Cor. 11: 23-30). Many Christian congregations also held frequent communal meals, called agape, or love-feasts. They were often funerary in nature, remembering the dead. Sometimes these meals would be followed by the Eucharist, but generally they were separate. Since Christianity was illegal, there were no public buildings or gathering places. Most ceremonies and celebrations were held in private homes. In Rome, Christians began meeting in the catacombs, yet this was to be close to their beloved dead, not to avoid detection. Responding to the commands of Christ, all Christian communities expended plenty of resources on charitable works. This included care of widows, orphans, and the sick. Christian travelers would receive generous hospitality in the homes of other Christians anywhere. The rise of congregations of Gentile Christians did not mean the end of parallel communities of Jewish Christians. Hybrids of sorts also existed, wherein Gentiles would become Christians but adopt some Jewish practices. Frictions would often arise between Jews and Jewish Christians. As the numbers of Christians expanded, Jews would sometimes persecute Christians or turn them in to the authorities. Around 85 A.D., Jews formally declared Jewish Christians to be heretical. Throughout the world, Jews began praying in their synagogues that "the Nazarenes and the heretics be suddenly destroyed and removed from the Book of Life." Jewish Christian communities survived into the fourth century, yet they were a tiny presence even by the mid-second century. The Jewish Revolt changed the Roman perspective on Judaism and, potentially, Christianity. Widespread anger at the Jews led to strong levels of anti-Semitism. 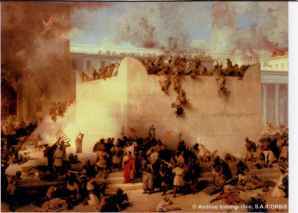 The destruction of the Temple in Jerusalem had a profound effect on Jews across the Empire. Jesus Christ, who was crucified for sedition by the Roman procurator, could be cast in the light of the rebellion. Rumors, falsehoods, and the passing of the generation that knew Christ led to the writing of the Gospels. In the first few decades, the Old Testament was paired with oral accounts of the sayings of Jesus and the letters of Paul during religious instruction and celebrations. The synoptic Gospels and the Acts of the Apostles were written between roughly 68 and 71 A.D.: first Mark, then Matthew, then Luke, and finally, Acts. These written accounts spread rapidly through Christian congregations and achieved widespread acceptance. Numerous other works were penned after this, many of them finding favor in various congregations. Among these was the Gospel of John, written sometime around 100 A.D.
By 200 A.D., there was an established canon of the New Testament. As with authority and orthodoxy, a direct connection to the apostles was crucial for verification and acceptance. By the second century, Christianity had spread through many cities and even sometimes into the countryside. The letter of Pliny the Younger written in 112 A.D. describes Christians in the city and countryside, so many that the temples were all but empty. Stories of bizarre rituals were becoming less common as more people learned of the religion. By the third century, Christianity even began penetrating the Roman aristocracy, predominantly among women who learned of it from their household slaves. A religion that saw women and men as equal in God's sight was attractive to them, as was the Christian insistence on the sanctity of marriage. Geographically, Christianity was a creature of the Roman Empire. It spread throughout its borders. There were always more Christians in the East, in places like Asia Minor or Egypt, but that is because there were also many more people living there. Italy, which was also populous, had 100 bishops' sees by 250 A.D. In the second century, Christianity spread slowly outside the Roman borders to the east, particularly in Armenia and Mesopotamia. 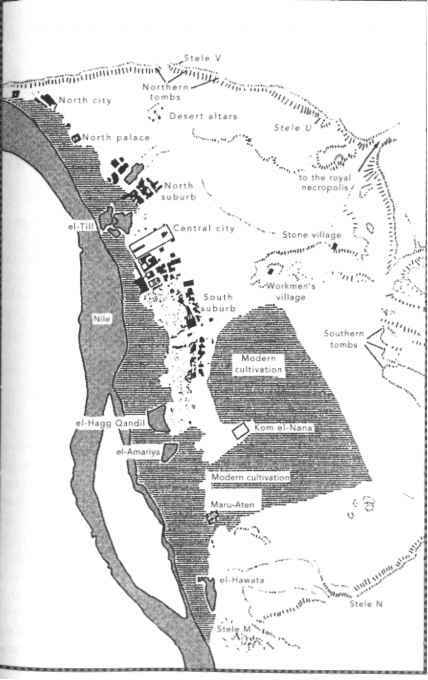 There is also evidence for early communities as far away as India.